This presentation style is now a trademark. Now, surely you’re thinking that it’d be hard to get delicious tasting strawberries at this time of year, sure there are store varieties, but nothing can compare to those fresh from the garden. Which is true, but these are from the freezer, I stumbled across a bag of old variety strawberries, the harder, slightly tarter type I grow along with the sweeter new kinds, I say that like I planned it and didn’t just get gifted a lot of strawberry plants a few year ago. In truth you’d imagine frozen anything to be inferior, I’d tell you honestly if they were, I’m not proud, but these are as fresh as the day I froze them, they were picked and frozen within minutes, what amazed me, Dear Reader, was the basil that I chopped and froze in water has retained it’s taste and aroma perfectly too. So, what else could I do but make The Titular Sauce, and since I was making it for rice today I felt like changing things up a little. Again the point of these informal recipe reworks is to share what I’ve learned. I’ll gladly freeze basil the same way next year, I never expected much, but I suppose fresh really does matter, it was a matter of half an hour before it was all harvested from the plant, chopped pushed into ice-cube trays, next year I’ll use the large ones, which recently did their duty for turkey juices (Something on that too). Okay, sorry for the even more confusing aside, I never promised perfect clarity, just rambling, useful tips. So, there was a holiday called Christmas recently, you may have missed it. But on that day, in the Irish way we overcook a turkey, yes, the Irish overcook meat to a nicety, turkey is dry already, but nothing can match the prowess of an Irish person making sure it’s “done”, which in many a case means almost dehydrated. So, this year we decided to buck tradition and turn things on their heads, or rather their front. We left the turkey breast side down and wrapped it up tightly in tinfoil. It did cook for longer than needed, you can’t get away from that completely in Ireland, remember that beef here is grey, but as we lifted it the carcass split, which was worrying at first, then the brown meat, usual dark grey, was just lightly coloured and, for the first time in my life, delicious, usually relegated to the second day curry, this time it was fought over. The leg bones slipped out, the breast meat just came away whole, the whole bird feed three people for three days and all that remained was bones. The meat was flavoursome and moist. Cooking it upside-down kept it from drying, the legs from burning and made it a miracle bird to those used to dry, almost tasteless meat. The juices were saved, frozen into cubes and used for gravy, they’ll stay in the freezer a while long. Anyway, sorry for the long aide, onto the dish of the day. So, strawberries as the nightshade free tomato are firmly a favourite of mine now. They don’t replicate a tomato perfectly, but they impart something of the sweet, tartness that is really very hard, if not outright impossible to find without nightshades or citrus. What I did differently was I left the chicken breasts whole, rubbed them with brown sugar, salt and pepper. They’re golden from the butter and oil the onions were fried in, I kept all the sauce and meat to one pan, more flavoursome that way, not that you can see it under the sauce. The onions are cooked until they just started brown, the chicken goes into a high heat for a minute a side, to get the sugar to caramelise a little, they cook a while and then I remove the chicken to rest and toss it the strawberries and basil, leaving the sole additional sweetness to be the brown sugar sticking to the pan, the whole lot simmers and cooks until everything has melded and melted into this wonderfully contrasting sauce, the slightly sweet onions and the warm, tart strawberries, the pungency of the onion meeting the gentle sweetness of the berry is really something, the richness of the butter giving it an pleasant oily mouthfeel, okay, sorry, that pretentious, but it is good. The chicken, with resting juices, go into the pan for the final few minutes. The sweet potato is cooking while this is with this sweet seasoning, brown sugar in there too, just a simple saute in butter and olive oil, I find the oil stops the need to add too much butter when it dries out, making it soggy after a while. The whole is tossed onto the rice, perfectly steamed, as it has been since I originally found the recipe and figured out the ratios for every kind of rice I use. So, Dear Reader, a lot for such a basic recipe, but you know it helps to know all you can about what you’re eating, you can adapt and tweak anything if you know how and why it works and if you’re on a restricted diet that kind of skill is vital. It’s easy to get into a rut with food, sometimes you need to play around a little to remind you to enjoy what you’re eating or even just the preparation of food. That’s it for today, Dear Reader, I’ll be back again sooner rather than later, hopefully with something new to share. Take care. Two carrots were intertwined, but grew separately. I was confused until I remembered these were a rainbow mix. Freezing is really perfect for this kind of use. No way I’d be able to use all I harvested in time. Well, it’s been two minutes since my last post, better hurry this up before I start losing my reader-base, I’m joking of course, I have my Dear Reader and that’s all this style of writing needs, right, Dear Reader? Heh. Did you ever have one of those days where you just had to improvise because you hadn’t a fully stocked kitchen, but everything ended up delicious? 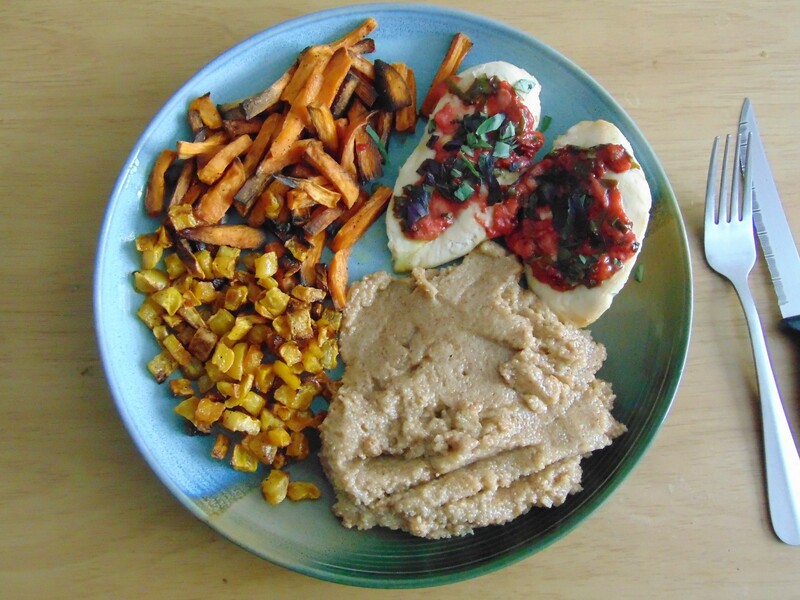 If I had planned this, carefully running out of garlic, sweet potatoes and purposely failing to remember what I had planned to eat, not forgetting to forget the natural peanut butter, I’d have been hard pressed to do as well as I did. 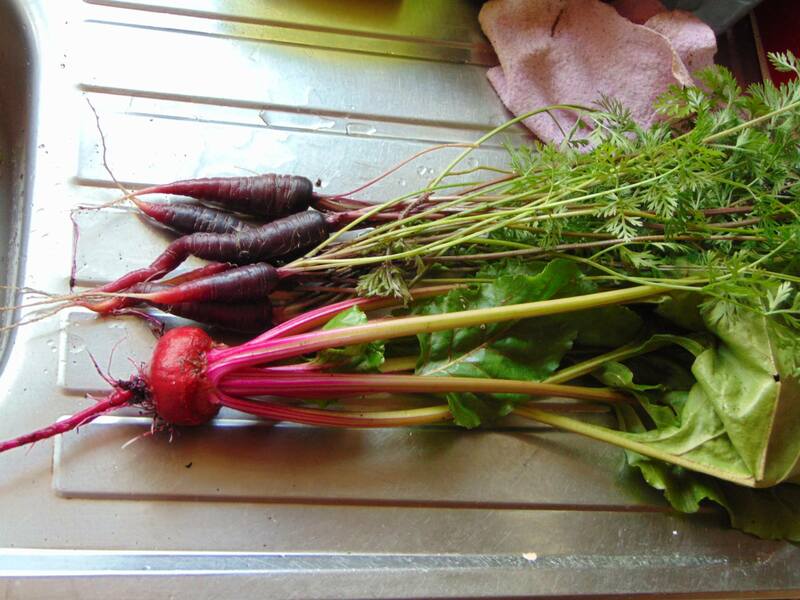 The garden was very supportive of my efforts, the purple carrots might not be large, but they are flavoursome, the first of the second batch of beets was a beautifully mottled white and pink, the shed onions, as I now think of them, hid a few small ones perfect for roasting and a harlequin squash was just what was needed and was found happily sitting in amongst the rest, the frozen strawberries, like jewels in the sunlight, hid themselves well, but I found them eventually, the basil I froze earlier in the year when it seemed endlessly harvestable was a blessing after all this time. The garden was a huge part of this Thursday’s dinner. Big and chunky was today’s theme. Fruit on steak is still too good. Amaranth was cashew, it’s that or quinoa with a nut butter, which is drier and goes well with the mash I have in the freezer, the sauce is Strawberry and Basil and even after freezing you can still taste the basil and the sweetness of the strawberries hasn’t diminished a whit. It’s nothing new, hence the title, but I’ve never tired of this dinner. I get all I need in it and it really fills and satisfies. I’m finding a different enjoyment of foods these days, the earthy beetroot, the spicy carrots the tender slightly crisp squash, the natural sweetness of he strawberries permeated with the rich herby flavour of the basil, the slight sweetness present in the butter-soft onions, it’s afar cry from the trash I used to eat and no other word will do, Dear Reader. 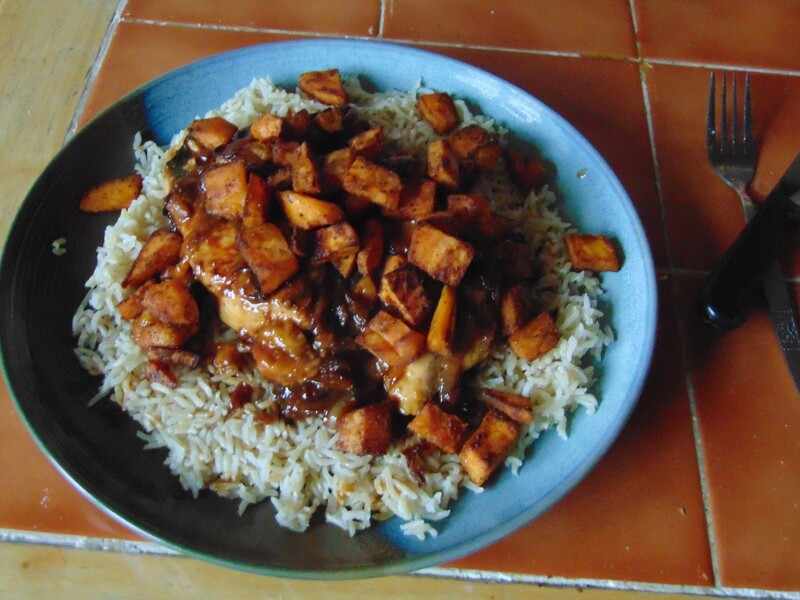 I’ve learned to cook meat, vegetables and grains and seeds near perfectly, much better than the burnt mess of processed “chips” and dried out hunks of beef slathered in instant lumpy gravy. It takes time and effort, Dear Reader, but it’s worthwhile to sit and really enjoy eating, an almost guilty feeling rises, but I know I have no fear of ill health or weight gain as this diet was crafted foe me by a very well informed person: Me. I’m really glad I have me watching my back, Dear Reader. I’ll be back again, a little later this time, so take care until then. It’s very humid today, Dear Reader, I’m feeing better, but the heat is still extreme, we’re really not suited to these temperatures. Still, even though I had to shovel this into myself, I do have a recipe, that on any other day would’ve been savoured, but with the rising heat it was a race between my eating the curry or passing out into it. It was close. So, we’ve done basil in various ways, mango too, we recently had both in a cold sauce so naturally I had to look at developing a hot combination. 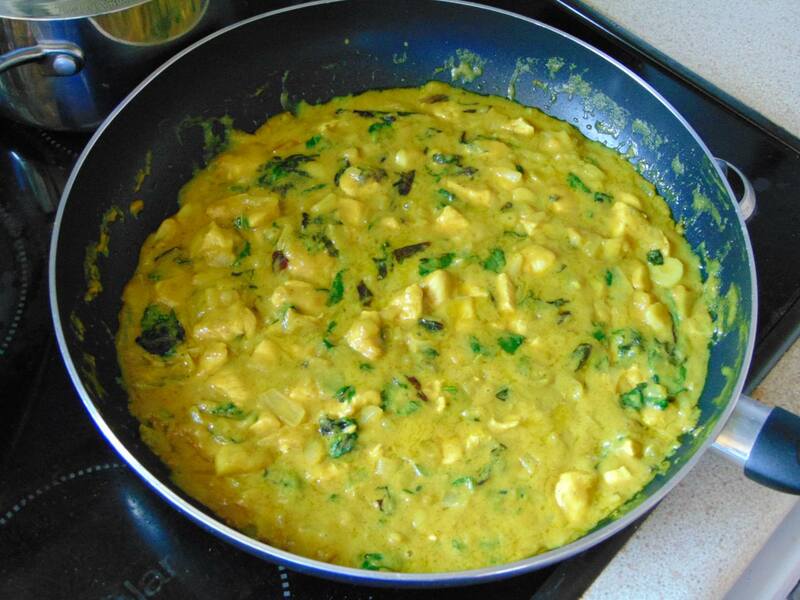 This is mixture of various recipes here, search either basil or mango and you’ll find them. Jack is too hot to hyperlink, which sounds like a terrible autobiography title. So, let’s try to do the food blogger thing that I do do..do? So, today I’m using a mixture of Blue Spice and Red Rubin, very strong aniseed overtones, they contrast well with the mango, bringing the sweetness out more along with the salt. 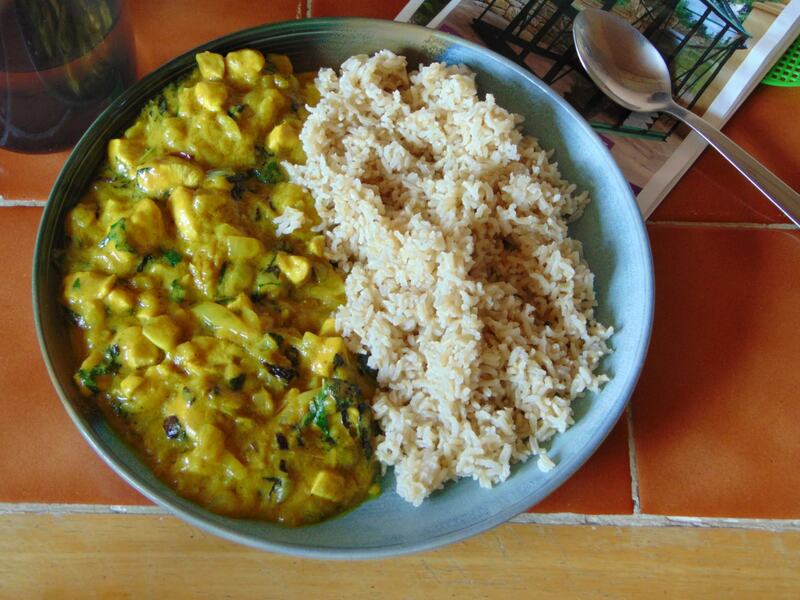 The curry’s preparation is very simple, the spices are basic, but warming, I wanted the sweetness of the mango to be the sole sweet element. I read this at times, Dear Reader and hope it never comes off as pretentious or ostentatious, but having an actual description of what you’ll be eating is a great indication of whether it’s worth trying and knowing why ingredients are chosen can help you understand them and use them yourself in various ways. I use a pan because this needs reducing, I made a double batch above, I froze the second for a very hot day when I’ll need a quick dinner. The mango and the fatty coconut cream add a richness and thickness, which are pretty similar and why most commercial products love those gums. We don’t need them, Dear Reader, we have real richness. 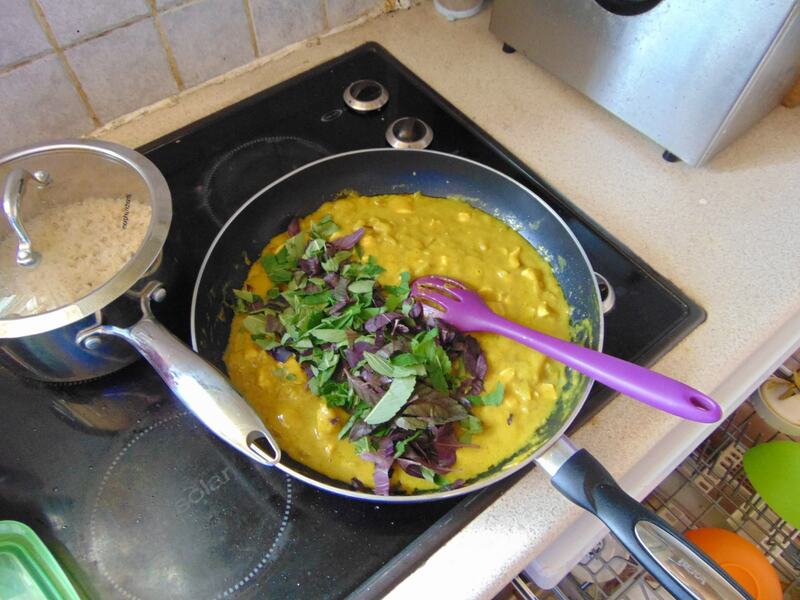 Eating it is very similarly textured to a spinach curry as there’s so much basil you have to notice it there’s going to be a lot of different flavours depending on your basil and how fresh it is. I like the aniseed flavoured herbs mingling with the garam masala. They compliment each other really well, the mango is very prominent too, which I enjoy, it must be in season right now because the mangoes in the shops are very sweet, ripening much too fast though. So, there we go, Dear Reader, the basil harvest was well worth the effort, the last of the blue spice will be added to cold brew teas, which I think are helping with my hay fever/histamines. If not they’re doing no harm and the worms are still alive thanks to the moisture in the tea leaves, at least one is, I hope others are too! Until later, Dear Reader. 1. 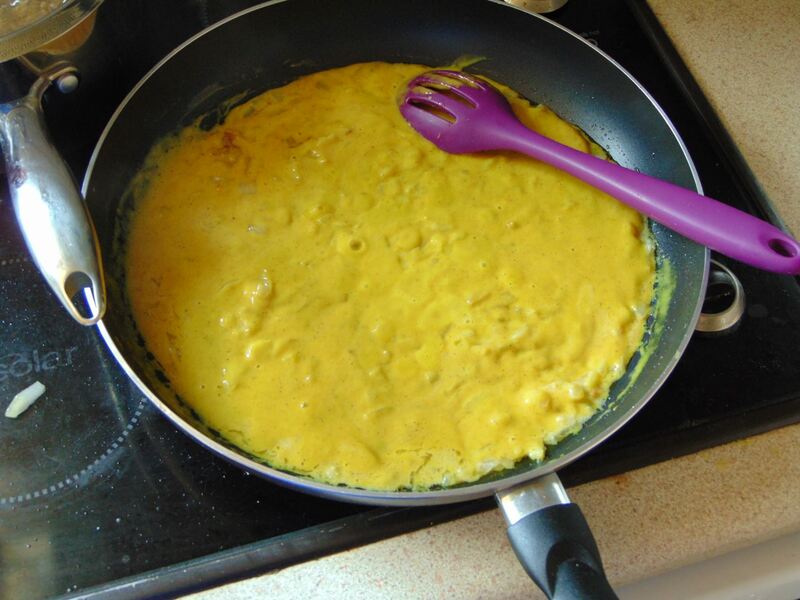 Blend Mango, Coconut Cream, Garam Masala, Tumeric and Sea Salt until smooth. Set aside. 2. In a frying-pan fry Onions, Garlic and Ginger in Olive Oil under Onions are tender, about 10 minutes. 3. Add Sauce, loosen with a little water if necessary, to pan and bring to a gentle simmer, do not boil. Add Chicken and cook for 10-15 minutes. 4. Add in basil and stir to combine, cook for a further 10 minutes. Couple of points before I begin, Dear Reader. The recipe is vegan even if my use for it isn’t, the original looks nothing like mine, mine is bright green!, no idea why, I’ll report back on the frozen version, I topped it with more EVOO to stop the basil turning black. Once you cut out acid and nightshades dressings and sauces start to become scarce, Dear Reader, but here I am in the year of 2018 with a sauce featuring fresh basil. Every year I wonder if I’ll find anything new to do with my limited list of edibles and I somehow muddle through. This is made with a mixture of genovese and Thai basil, you can use anything you’d like naturally. I had too much so I’m freezing half as a test. My mango had started to go bad, but I had enough, this was already cut down a lot and when I cut it down further I still had to much for one serving. Not a bad complaint, I’ll update this with the frozen option when I get around to it, could be a while, though I see no reason as to why it shouldn’t be fine, I’ve frozen all he ingredients in different ways before and they came out just fine. I like t be absolutely certain of things before I tell you about them, Dear Reader, I might not be much, but I’m responsible. I used the Jerk Rub with a little honey. Not a great deal goes into this and because it’s unheated you lose none of the freshness, there’s a beautiful balance of fruitiness and sweetness from the mango and a spicy fresh kick from the basil and raw garlic combination. 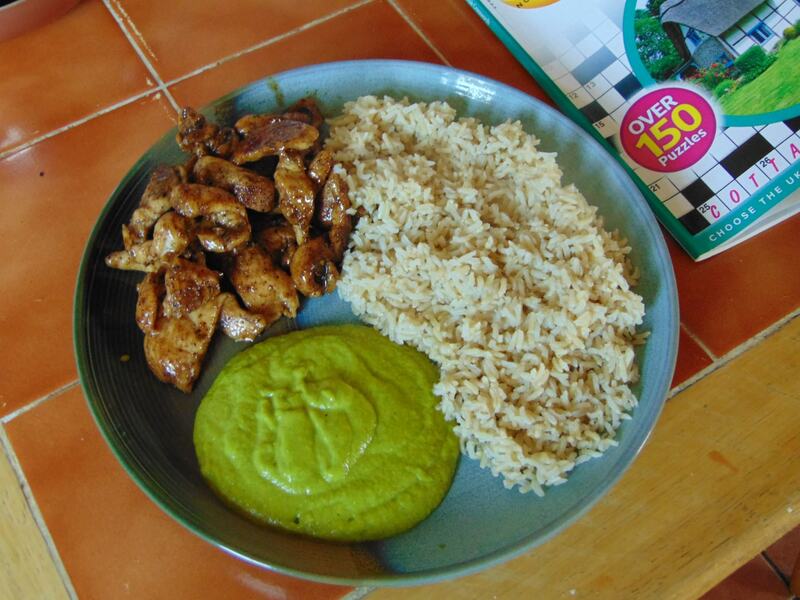 I honestly don’t know how you’d use it, over a salad freshly picked from the garden perhaps?, as for me letting it cut through the flavour of warmly spiced chicken strips and soaking into fresh rice seemed just right. With my hay fever, I think that’s what this is, wonder where I’m getting the pollen from? A mystery for the ages, Dear Reader, fresh and fruity is best, besides this heatwave isn’t doing wonders for my appetite, I still have to eat, but I’m feeling pretty indifferent towards food. This was nice and bright for a warm Summer’s day. See you sooner than you think, Dear Reader. Makes Two Servings. Can be frozen, just top with Olive Oil. 1. 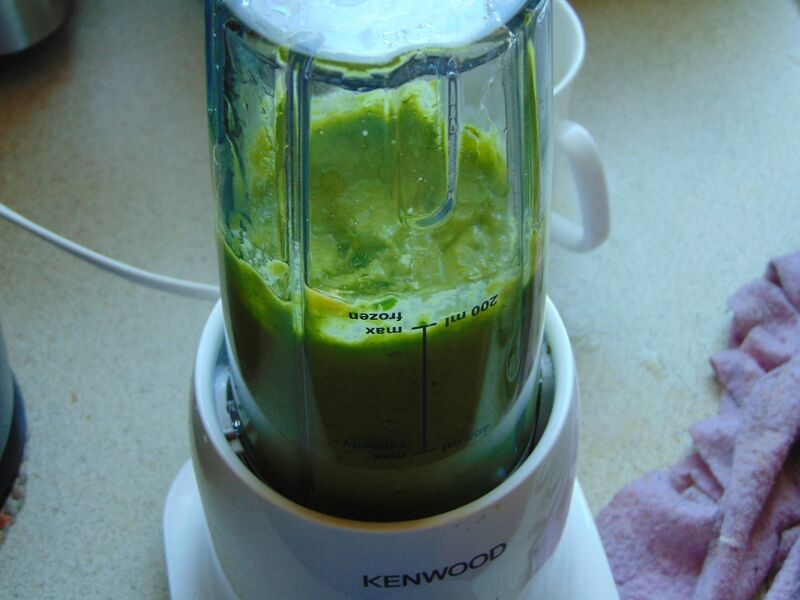 Add everything to a blender, layering the basil and mango in alternating layers, finally topping with the oil, then pulse until everything is smooth, no need to add extra water. Use right away or cover and leave in the fridge for a few days. I just had enough sage. Original can be found here. You know this recipe, you’ve seen it dozens of times, there’s nothing new here, it’s just that I’ve never had a reason to make it before. Herb butter sounds great, but I don’t often use better when coking, at least not when I’m using herbs. But, I figured out a use. My mother makes stuffing and uses fresh sage, but often the sage isn’t ready when she’s making it, so since she fries her onions in butter I thought this would be an ideal solution. I did tweak it one way as you can see below. You’d be best to use freshly picked herbs, the smell of the fresh sage is intense, even for a older plant. I hate to make something like this without reason, last year I froze herbs in olive oil and struggled to use them, I think a fair few went into the bin, this is ideal as they’ll be used up fairly quickly. If you want really fast stuffing you can also blitz the onions and freeze them the same way. A quickie, but handy to know. See you later, dear reader. 1. 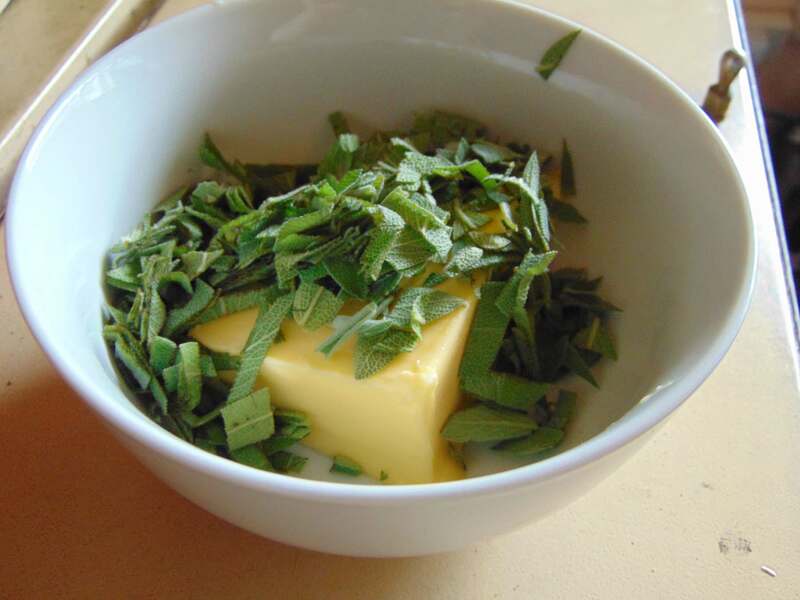 Add everything to a bowl and stir together until Herbs have been evenly distributed throughout the butter. 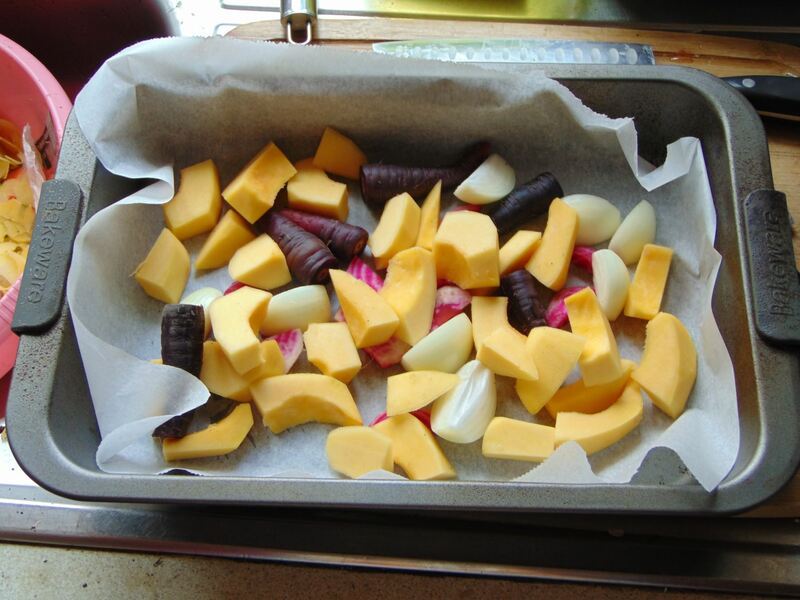 Scoop in a container, roll into a clingfilm log or fill into ice-cube trays. There’s a reason I so rarely pair berries with eat, it’s because it’s disgu…oh, way, no, it’s the vinegar that seems to be prevalent in so many of the recipes that use berries in a savoury application. I can’t tolerate vinegar, as to why, ours is not to question why, dear reader, ours is to find recipes that we can use or tweak into usefulness. Now, first things first. 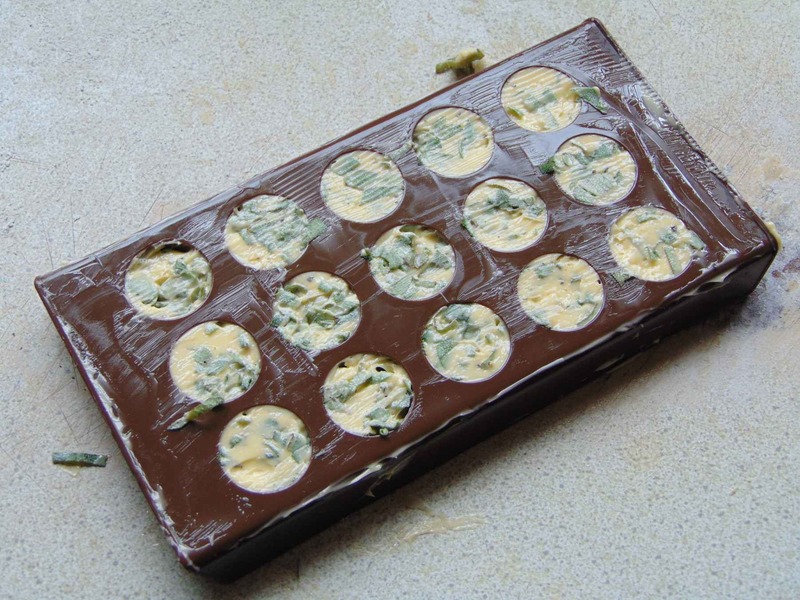 I tweaked this by cutting it down, but also by adding double the basil and removing the mint, I’m just not partial to mint, I think I like it in hard-boiled sweets and that’s about it, I also topped it with Thai and Dark Opal, which of course you can’t skip, no, no changing recipes ever! I had it to hand, use what you have, I’ll be making this with yellow strawberries eventually. I’m just listing the sauce, you can use it on chicken, or whatever, just dribble it on everything. Or, don’t, people might get angry as you spread the sauce with a flourish if the wrist across their balding pate. 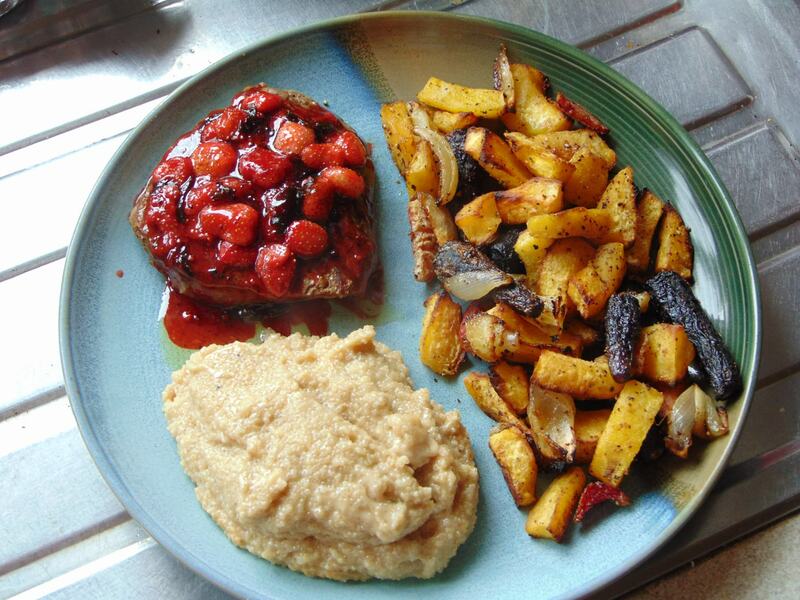 I wasn’t sure how strawberries would pair with meat, so I opted for the all-in approach and even went with the classic paring of peanut butter (Amaranth) and strawberries. 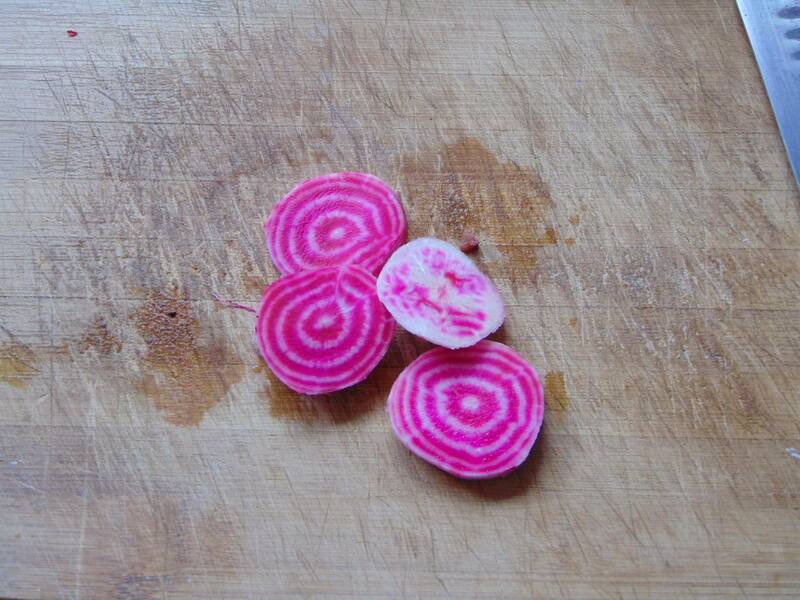 I’m as eating more of my yellow beetroot. This is really a from the garden type of dinner. Now, how did it fare? Well, it was really delicious, the hit of the aniseed from the Thai basil was perfect to accompany the slight sweetness of the strawberries, which lost none of their fresh taste in being cooked down. It’s very mild and just adds a pleasantly fresh undercurrent to a dish. I thought it’d be like jam on top of meat, but it just had a subtle taste that I really enjoyed. If you like cranberry sauce then this is right up your alley, there’s no need for sugar in this as the strawberries are sweet enough in themselves and as there’s not much sweetness outside of them you avoid a cloying sweetness that would spoil a savoury dish. It’s simple, but a wonderful way to use strawberries. Okay, I’l be back later , dear reader, smelling faintly of onion. Mysterious, huh? Until then, take care. 1. 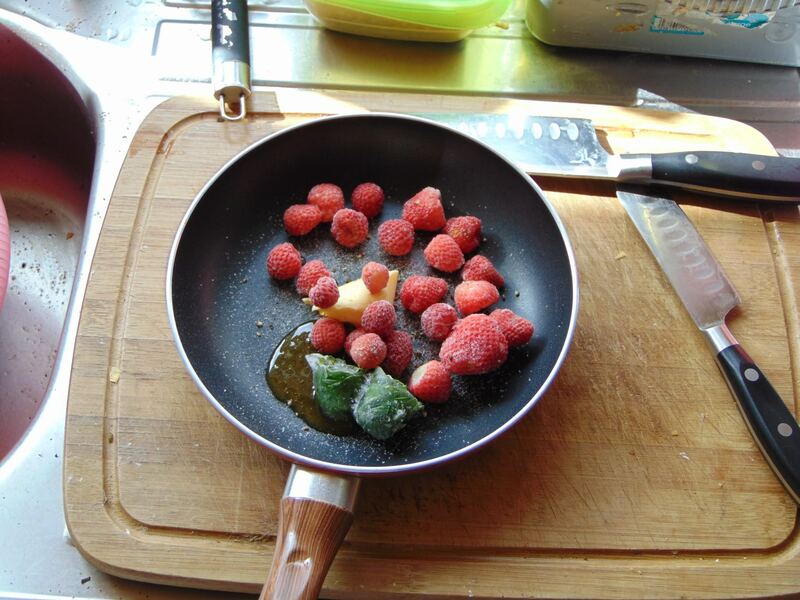 Heat Olive Oil in a pot or pan and when hot add Strawberries, Basil and Orange Juice. Simmer over a medium heat until strawberries have released their juices and the Sauce has thickened. Pour over meat or vegetables and top with Thai and Dark Opal Basil. Absolutely nothing. I’m joking, but the temptation to just post that remains. Seriously though, I think there are a few pointers that I can share to growing many successful harvests of basil. These are just anecdotal tips from your forever friend Jack, nothing more than the summation of my experiences. The reason why every guide here is rough is because I’m constantly learning and the me sharing my experiences in the here and now will be a very different person in the future. There does have to come a point where I’ve learned as much as I can, but you can never be sure. So whether you’re new to basil an old hand or just vaguely interested in these little herb, here are a few tips, in the now ubiquitous list format, for getting a large, healthy and delicious harvest. I’ll even point out a few tips for pesto, I’m still new-ish to pesto, but now I’ll only make it using he freshest herbs, my own in other words. I never ate it before I couldn’t eat any commerical pesto so take my tips as you will. You’ll enjoy watching you basil get bigger and bigger, but one of the problems is that when it grows very tall is that it can get weak stemmed, if you’re not cutting it and letting it bush out the basil can end up wobbly. The other issue is that when it reaches it’s maximum height it will start to flower and as pretty as they are you don’t want them spoiling the taste of your basil. Either pinch them off or just cut below them. What you want is a basil that isn’t too tall, has no flowers and has leaves from everywhere on the stem. Now this does assume you have basil ready, whether you buy it as a seed, like Jack, or you buy it from the shops and propagate it via cuttings, like last year’s Jack. The best way I’ve found is alternating between light harvests, small amounts taken with careful hand, and heavy harvests, large amounts taken with rough cuts. The idea is that you do need to keep basil pruned, removing the light, small leaves when healthy is great as you can use them, rather than letting them wilt, this will let the plant feed itself and grow. For heavy the best time is when there’s too much top growth, way too many leaves, you can just cut it down a few inches, at the growth node of course, and the plant should have sufficient leaves to grow again. The best way to determine the stage is by how many leaves are on a stem. If they’re mostly empty then you don’t want to take too much. All crowded and hen it’s time to take a heavy hand. Basil is tough, but smart pruning means you get more out of each plant. Like you and me, dear reader, plants need to feed to grow. The thing about herbs is that they release their flavoursome oils when they struggle, the less for it to draw upon the better tasting it is. So naturally feeding isn’t advised, but you should do it. Huh? Bear with me. You want the basil to be at it’s peak when harvesting, just wet enough to be healthy, the smell will spread throughout any room, it’ll taste best then. After a few harvests you’ll want to add a little plant feed, this will help the plant grow again and stay strong. The only issue is that the taste will be almost non-existent while the nutrients are in the soil so don’t over-feed it or use slow-release pellets. A little liquid feed is all you need. Now this pertains to Ireland wacky weather. I had basil last year in a plastic greenhouse that was just ready for harvest so I let it until the next day, the next day’s weather was a cold snap and the basil wilted and died. Now that I have a well insulated greenhouse that holds heat better, and keeps out some of the cold, there’s a world of difference in my basil. You might be best to keep your basil indoors if you don’t have a greenhouse. It’s very disheartening to see basil just die suddenly. I did find the Thai a tougher basil, but that may have been a fluke. 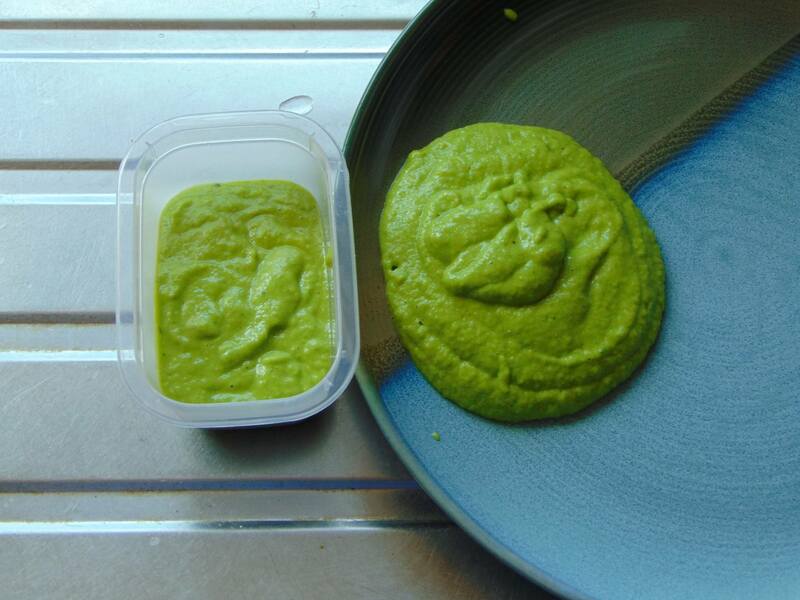 I use to blend my pesto to a smooth consistency and I feel that that’s a disservice to the basil. I find that a rough blend, where the nuts are just broken up and there are few shreds of leaf left gives much better texture and even improves the taste. You’re not disguising stems or hiding poor quality leaves, this is your harvest and you should use it the best way possible. I don’t recommend using the stems, they’re okay when very young, but become rubbery in time and eventually woody when the weather changes to cooler temperatures. This is more of a preference, but if you are freezing, and topping with oil naturally, then I find making a thick paste, topping it before freezing leads to a pesto that clings perfectly an doesn’t end up with pasta that’s floating in oil. I love oil and rich pasta dishes, but I think the freshness is where pesto shines, overwhelming the basil is a mistake I’m glad to say I no longer make. I’ve mentioned that I grow a few varieties of basil, the sweet is the most versatile, but the others offer a unique taste in dishes. The issue I find is that some overwhelm while others fail to stand out enough on their own. I’ve found that mixing the Thai (They call it cinnamon on the packet, but it’s Thai) with the dark opal gives the Thai’s aniseed a slight undercurrent of something sweeter, the lighter flavour of the dark opal is still present, more so thanks to the contrast in flavours. It’s also helpful if you just don’t have enough basil to make pesto, a little Thai with sweet is really fun and different ratios make really different pesto.